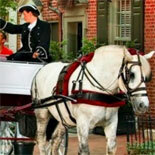 Journey back in time on an enchanting carriage ride through the tree-lined streets of Philadelphia's Independence National Historic Park, the nation's most historic square mile and Society Hill, the largest collection of original 18th century homes and churches. 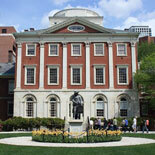 This tour also includes Old City and Betsy Ross House and much more! 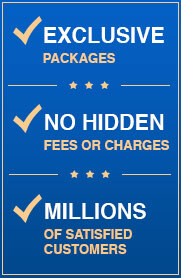 Your private coach is driven by a knowledgeable guide who provides expert personalized attention. 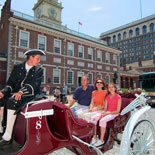 Stately draft horses and certified drivers make this tour a family favorite by day. 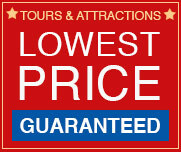 Tours are available during the day only from 10:30am - 2:30pm daily. Closed Christmas Day and New Year's Day. There are no age requirements or restrictions. All tours subject to availability, weather permitting. Maximum occupancy per carriage is 6 passengers.